The Hangover was an inventive comedy full of fun and natural chemistry between its cast with a breakout performance by Zach Galifianakis. The Hangover Part II was a dark, twisted, and dreadfully dull, hateful beat for beat reconstruction of the original. The Hangover Part III is an often lazy, tired retread of the same story yet manages to still be laugh out loud funny. The third film goes to dark places and feels like an action movie injected with comedic bits. Surprisingly, I found most individual scenes far more enjoyable and crowd-pleasing than expected. Director Todd Phillips returns to the well again. He abandons the one night stand "hangover" formula of the previous two, instead mining material from part one. Most scenes are at least either disturbingly fun, funny, or immaturely amusing. As a whole, it's rather cosmetic and flimsy, but despite that, it's a good time and provides many ridiculous laughs. An early scene where Bradley Cooper's Phil makes a reference to the transvestite debauchery of Bangkok in Part II is much funnier than anything in that actual film. The boys are back as Galifianakis and Cooper are joined again by the affable Ed Helms and of course Justin Bartha somehow manages to miss out on most the action for no real reason. Galifianakis' Alan is ascended to the main character with mixed results as we follow his story of (sort of) redemption after spiralling deep into his own vices after Bangkok. The film has a true villain as Ken Jeong's annoying Mr. Chow is placed front and centre this time around. It's all about Chow and Alan and their bizarre relationship leading to a prison break, Mexican heist, casino break in, and general mischief. Part III borrows heavily from our reverence and nostalgia of part one with a slew of references, flashbacks, and cameos by Heather Graham, Mike Epps ("Black Doug"), and even "baby Carlos" (now a four-year-old, played again by Grant Holmquist). Laughs endure based on the good will of the original The Hangover. A healthy injection of Melissa McCarthy (a nod to her Alan like role from Bridesmaids) as Alan's equally off the wall amour in a brief scene is oddly compelling. 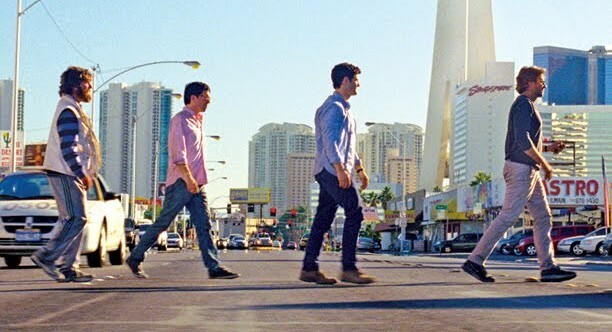 The Hangover Part III is far from comedic high achievement or even the heights of the original, but it manages to close out the dark adventures of Stu, Phil, and Alan nicely. Phillips sticks too much to the original formula even without the usual narrative structure, but there's not much new to mine as the Wolfpack returns to Vegas after a detour to Tijuana. The sequel does remind us of why we loved The Hangover in the first place and despite the weak story, recreates the charm of the original as it further pushes the boundaries of tasteful, acceptable humour.